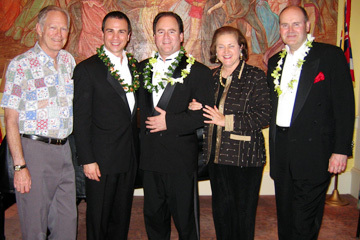 A FOUR-STAR SHOW BY THREE PHANTOMS: Hawaii Theatre President Sarah Richards and her husband, Manning Richards, left, congratulated Kevin Gray, Craig Schulman and Cris Groenendaal on a great show Thursday after the opening night of "Three Phantoms in Concert" at the Hawaii Theatre. The three Broadway veterans meshed perfectly in a glorious celebration of modern American musical theater. Gray didn't need a Cadillac and a line of dancers to make "The American Dream" a dramatic show-stopper; Schulman did a superb job portraying the emotion in "This Is the Moment" and "Bring Him Home"; and Groenendaal added a bright bit of musical comedy with "The Sara Lee Song." The "phantoms" also did first-rate work as a vocal trio with spirited renditions of "Brush Up Your Shakespeare," "They Call the Wind Maria" and "Standing on the Corner." HAPPY 218TH! : Australian Consul-General John Quinn welcomed Gov. 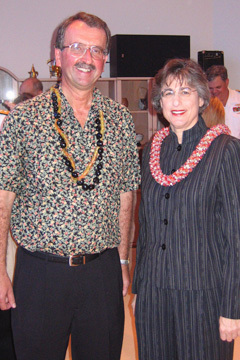 Linda Lingle to an upscale Australia Day party Thursday at his Honolulu residence. Members of the international business, political and military community enjoyed Australian wines, beer and hors d'oeuvres that included lamb loin, kingfish, and crocodile and kangaroo potstickers. Australia Day commemorates the landing of the first European settlers on Jan. 26, 1788. Quinn said that 14,000 people from 70 countries received their Australian citizenship during this year's observances. 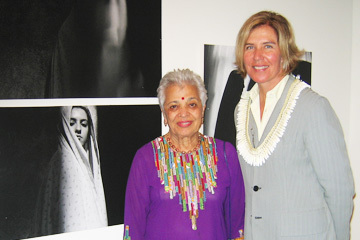 NEW ART: Susan Sayre Batton, right, deputy director of the Honolulu Academy of Arts, greeted Indru Watamul at the preview reception for "Persian Visions: Contemporary Photography from Iran" Wednesday at the academy. It is said to be the first show of its kind in the United States. ENJOYING A FRIEND'S WORK: Moana "Marty" Rumi Nikou attended the "Persian Visions" preview reception with his wife, Azadeh, and their son. 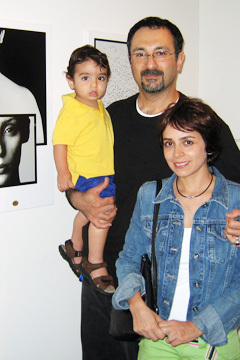 Nikou was particularly interested in the photos by Esmail Abbasi because he'd worked with Abbasi as a contributor to Aks, Iran's top photographic arts magazine. 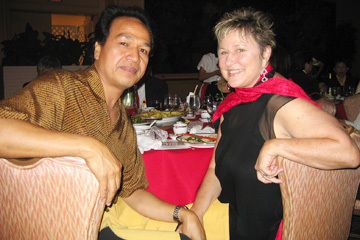 OUT ON THE TOWN: Filmmaker Vilsoni Hereniko and his wife, Jeannette Paulson Hereniko, attended the Narcissus Queen Coronation Ball as guests of Bertrand Chun Feb. 21 and appeared as special guests at the Kamehameha Schools Third Annual 'Ohana Film Fest on Friday. The couple's next film project is "Hibiscus," a love story set in Fiji in 2000.